A confirmed member of the Bloods Street Gang was found guilty today of a 2005 homicide that occurred in the city of Elizabeth, said Prosecutor Theodore J. Romankow. Tyrell Jackson, 24, of New York, was found guilty of murder and weapon offences for the May 9, 2005 shooting death of Dana Reid, said Assistant Prosecutor Caroline Lawlor who prosecuted the case. According to the investigation, Reid was shot several times as he walked along Madison Avenue in Elizabeth. 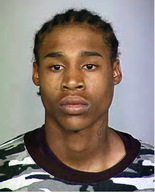 Jackson was arrested in December 2009 in Queens, New York, said Lawlor. Jackson was convicted following a four-week trial before Union County Superior Court Judge Stuart Peim. He faces up to life in prison when he is sentenced on May 20, 2011.